The technological and other structures of the Zollverein XII Coal Mine Industrial Complex are representative of a crucial period in the development of traditional heavy industries in Europe when sympathetic and positive use was made of architectural designs of outstanding quality. Zollverein is an exceptional industrial monument by virtue of the fact that its buildings are outstanding examples of the application of the design concepts of the Modern Movement in architecture in a wholly industrial context. Consolidation of the Zollverein mining claim area was completed in December 1847, when it was the northernmost mine in the region. It belongs to the Gelsenkirchen anticline, in which the coal seams are deeply stratified. 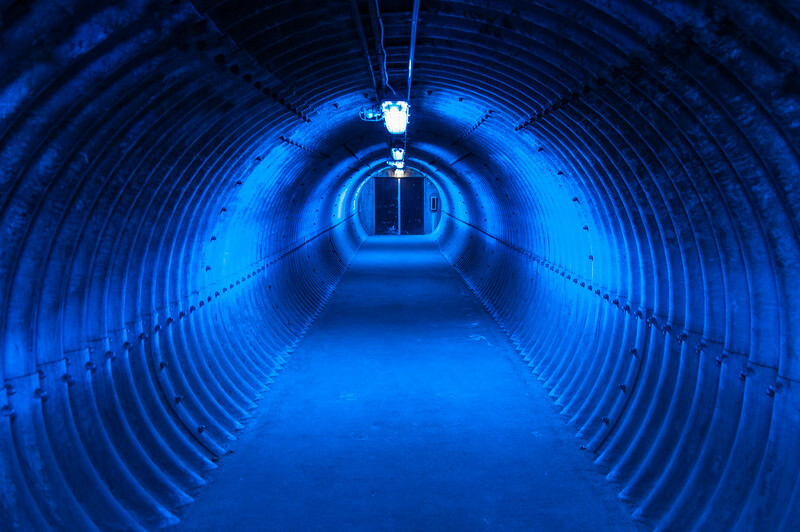 Mining began in the mid-19th century at a depth of some 120 m and finished at 1,200 m. By the end of mining, the underground roadways extended over 120 km; they were accessed by 12 shafts, opened up progressively between 1847 and 1932. 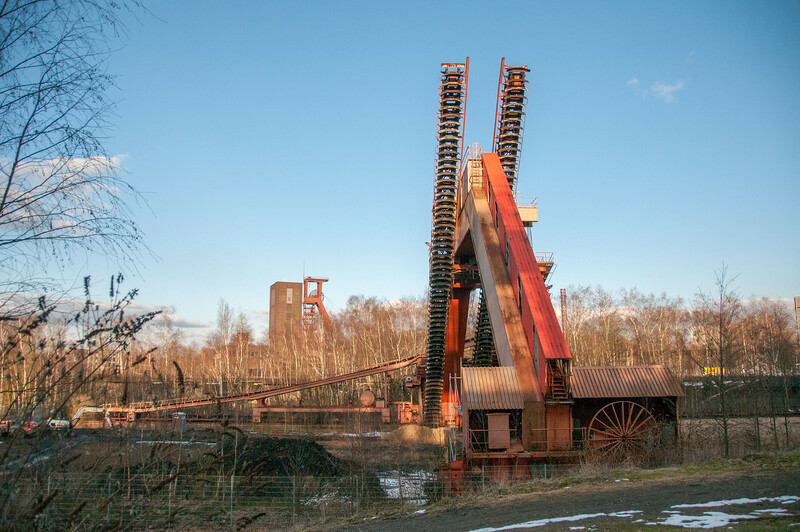 When Zollverein XII was opened, the earlier shafts were used solely for the movement of men and supplies; all the extracted coal was handled by the new shaft until the mine closed in 1986. The methods of mining evolved as technology developed from hand picks to mechanized coal cutting. The coals being extracted at Zollverein were especially suitable for coking. Consequently, the first stack-type coke-ovens were built there in 1857. The coking plant expanded considerably over the decades that followed. Few people will travel to visit an abandoned industrial facility, yet I must confess that I enjoy visiting such sites almost more than I do visiting Roman ruins. Every industrial world heritage site I’ve visited has exceeded my expectations. The Zollverein coal mine in Essen is a massive facility. Out of operation for more than 20 years now, the complex was a complete mining and coking facility which employed over 8,000 people at its peak. It was one of the largest coal mining facilities in the industrial Ruhr Valley. Almost all of the buildings have been left intact even though most of them have found new uses as office spaces and museums. Even the museums have been built around the old machinery which remains in place where they once operated. One museum is dedicated to the history of the Ruhr Valley and another is the Red Dot Museum of contemporary design. I recommend also visiting the coking plant which is the most industrial looking and larger of the facilities. The grounds of the complex are open to the public for walking or biking. There are guided tours available in German and English which meet in the largest building up the extremely long escalator. Expect to spend anywhere from 1-3 hours at Zollverein, depending on the tour you take. There are many hidden nooks and rooms that can be seen on part of a tour that is not otherwise available to the public. The Zollverein Coal Mine Industrial Complex in Essen is a cultural UNESCO World Heritage Site. It was inscribed in 2001 as a mine and secular structure. This site in Essen is known for playing a pivotal role in the development of heavy industries in Europe. The industrial complex is also known for its use of innovative architecture. The mining at the Zollverein Coal Mine Industrial Complex in Essen started in the middle of the 19th century. It is located in the village of Katernberg. Due to its proximity to railways that serve a route to Cologne, it was crucial to the growth of the industrial complex. 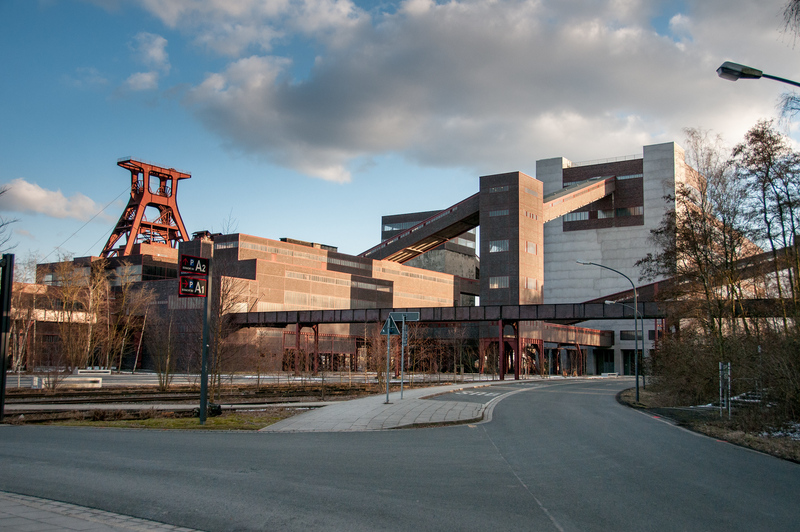 The Zollverein Coal Mine Industrial Complex in Essen is one of the UNESCO World Heritage Sites in Germany. It was inscribed during the 25th session. The first coal mine in the region was founded in 1847. However, the mining activities did not start until 1851 and went on until December 1986. 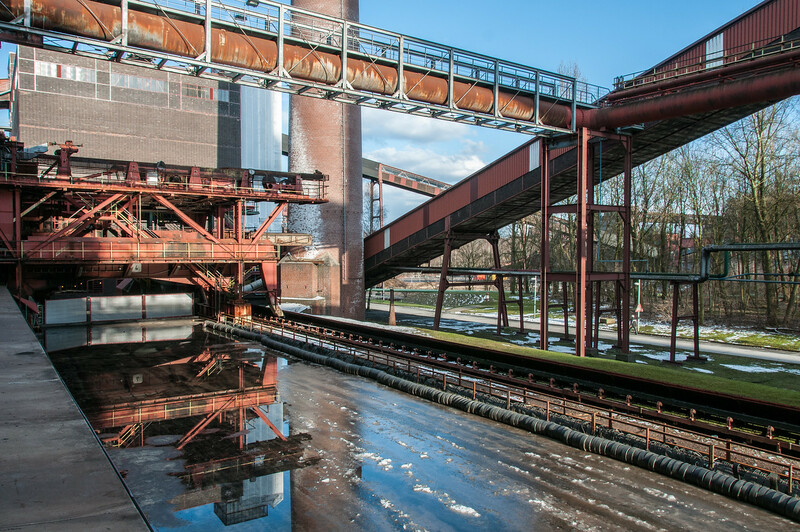 The site is composed of two parts: 1) Zollverein Coal Mine and 2) Zollverein Coking Plant. These two components that make up Zollverein Coal Mine Industrial Complex in Essen are considered as one of Europe’s largest. From 1847 to 1890, Zollverein Coal Mine Industrial Complex in Essen was founded by Franz Haniel, who is a Duisburg-born industrialist. He needed coke (which is a type of fuel made from coal) for steel production. There were test drillings performed at Katernberg region, which produced positive results for having a rich layer of coal. He founded the company to explore the natural resources in the area and divided ownership among his family and the landowners of the Zollverein territory. Shaft 1 started shrinking by 1847 wherein they managed to dig 130 meters beneath the surface to find a mineral coal layer. In 1851, the first official mining activities were started on the site. In 1852, Shaft 2 was opened and was used simultaneously with Shaft 1. These two shafts made use of visually identical stone towers. They also used a similar machine house. This concept was innovative at that time although it is currently adopted by many coal mines today. From 1890 to the early 1900s, the mine was heavily extended as there was great demand for coal, iron and steel production in the region. A few more shafts were opened as part of the mining operation’s extension. However, the operation suffered a few mine accidents involving fire damps caused by ventilation problems. Additional shafts were opened to resolve this particular problem. For the next few years after that, more renovations and expansions were done. By World War I, the Zollverein Coal Mine Industrial Complex in Essen has managed to produce 2.5 million tons of coal. By 1993 onwards, the Verbundbergwerk Nordstern-Zollverein produced 3.2 million tons of coal. However, it did not prove profitable enough as this coal mine decided to shut down operations. 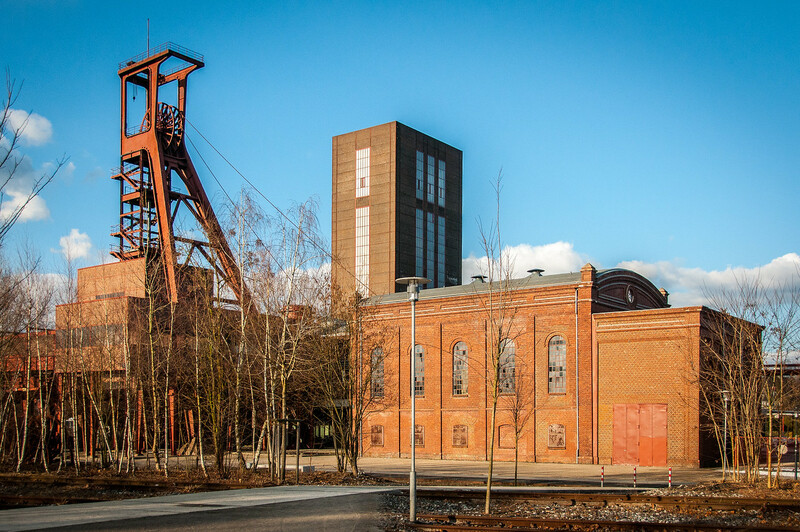 Hence, the Zollverein Coal Mine Industrial Complex in Essen was the only remaining active coal mine in the region at this time. Even when this site, as with most sites dealing with heavy industries, it suffered a period of decay after it was closed down. Nonetheless, it was declared a UNESCO World Heritage for its huge contribution to the coal mine industry in Essen for many decades.